For those of you looking to upgrade your TV with any number of various set-top boxes available from a multitude of manufacturers, Samsung looks to be throwing its hat into the ring, offering the all-new HomeSync box starting October 6 for $300. “What is HomeSync,” you ask? Well, imagine if Samsung took a Google TV set-top box and skinned it with TouchWiz, then only allowed certain Samsung smartphones (four to be exact) to control it. That’s what HomeSync basically is. Currently listed as supported devices on Samsung’s specs page are the Galaxy S4, Galaxy Note 2, Galaxy S3 and Galaxy Note 3. The way it works is you plug the HomeSync box into your TV via HDMI, then you can stream mobile content to the TV, share with other devices in your home, connect to the content at anytime no matter where you are, and also run certain applications on your TV such as YouTube, an Internet browser, games, and social networking apps. The box runs Android 4.2.2, features 2GB of RAM, 8GB of ROM, 1TB of storage, and can act as the center of your connected home. Nanda Ramachandran summed up HomeSync quite simply with this statement. HomeSync is a powerful platform that we envision to be the center of a household’s connected life. We saw an opportunity to create a companion device at home, that seamlessly syncs all of your mobile content wherever you are. If you are invested in Samsung’s ecosystem, then I could see this being quite useful, especially if everyone in your family currently owns a Galaxy smartphone that is compatible. But how often is that the case? For all of the detailed info, check out the press release below. Dallas, TX — October 3, 2013 – Samsung Telecommunications America (Samsung Mobile) announced today that Samsung HomeSync™, a household Android™ media center for storing, synchronizing and streaming content across multiple devices, will be available beginning October 6 for $299. With HomeSync you can share, view and control content from your Galaxy device directly on your TV while at home or on the go. HomeSync’s Android user interface is similar to your Galaxy smartphone or tablet and is easy to use. It allows customers to use their Galaxy device as a remote control to browse through various entertainment choices on their TV. HomeSync also provides 1TB (terabyte) of secure storage for up to eight separate accounts and allows each user the option to sync, as well as upload and download mobile content. This means photos taken by one family member at an event or on the road can be seen by another family member either from their TV or another connected mobile device. “HomeSync is the latest addition the the Galaxy family of products and builds on Samsung’s commitment to delivering innovative devices and advanced technologies to consumers,” said Travis Merrill, vice president of marketing at Samsung Electronics America. Perfect Companion for Your Galaxy Device: HomeSync is the ideal companion for the Galaxy S® 4 or Galaxy Note® 3. It is also compatible with other devices within the Samsung ecosystem, including the Galaxy S III, Galaxy Note II, Galaxy Note 8.0, Galaxy Note 10.1 – 2014 Edition, Galaxy Camera™, and other devices that use Samsung Link™. 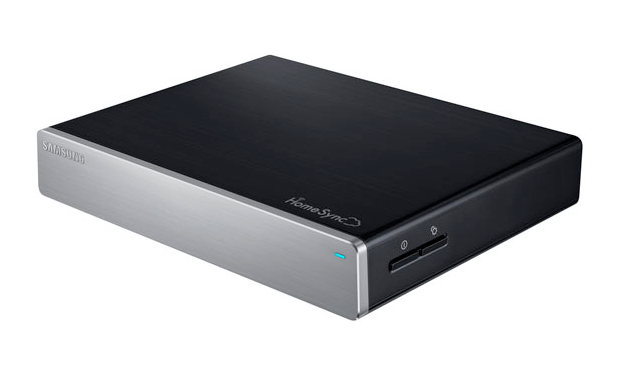 Storage Solution: HomeSync is a storage solution with an expansive 1TB drive that offers both shared and private storage options for an entire household’s core mobile content, such as photo albums, videos, and music libraries, in one secure location. Real-Time Sharing: Provides access for up to eight separate accounts and allows each user the option to quickly sync and share mobile content in real time, or select specific content to share. Register up to six devices per account so you can access your personal library no matter where you are, no matter what device you’re using. Access Anywhere: HomeSync provides secure access to your files, photos, music and home videos no matter where you are. Intuitive Control: Seamlessly control your content on TV with your mobile device – control what’s on screen using your Galaxy smartphone as a remote mouse and use your phone’s keyboard for easy searching, or mirror the HomeSync screen directly on your Galaxy device. Real Time Streaming: Stream content from a Galaxy device wirelessly to a TV – experience your created content, such as photos and videos, on the big screen then explore your favorite apps and play mobile games in a whole new way on your TV. Samsung HomeSync will be available at Samsung Experience Shops™ located in Best Buy and Best Buy Mobile specialty stores, Newegg, Amazon.com and Samsung.com beginning October 6 for $299. Plants Vs. Zombies 2 Hits Google Play Australia, Should Launch Globally "Shortly"